Painter, sculptor, musician, interior designer, furniture designer, shoe designer, yacht designer and even designer of a car prototype for Lamborghini, Arne Quinze is a designer with a thousand facets. His dynamism is only equalled by his openness of mind. Founder of the Quinze & Milan agency in Courtrai, this Flemish autodidact manages dozens of projects all over the world, from Berlin to New York, Moscow and Nigeria. 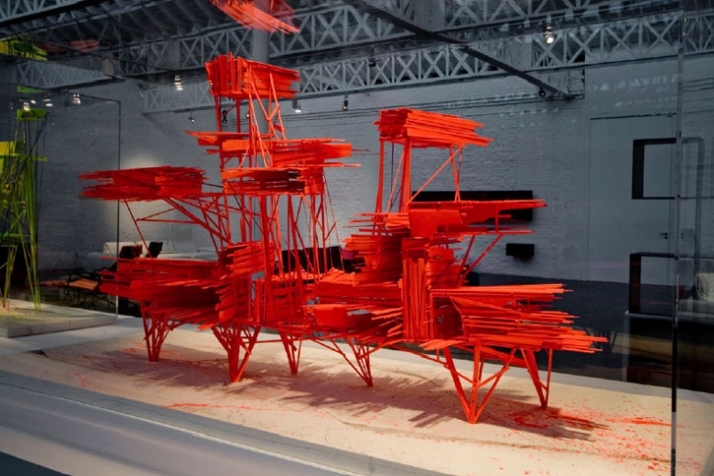 Arne Quinze likes taking risks and advancing into unknown territory. In his world, limits only exist to be exceeded. Daring is the key to success. This impassioned designer responded enthusiastically to this new initiative:was the first designer to occupy the Pierre Bergé & associés gallery from 17th to 30th April 2008. In a sound-filled atmosphere that sets the tone of the exhibition, people were able to buy unique pieces specially produced for the gallery: a set composed of a polyurethane made-to-measure table and five chairs, a series of six china vases in sensual forms, as well as paintings. Oriented towards a futuristic world, the ‘Walking-Light Houses’ based on science fiction, and the famous ‘stilthouses’, or the brightly coloured houses of the future, rised from the ground with special forms that are somewhere between architecture and design In total, some twenty unique pieces created by Arne Quinze were for sale during this first exhibition.